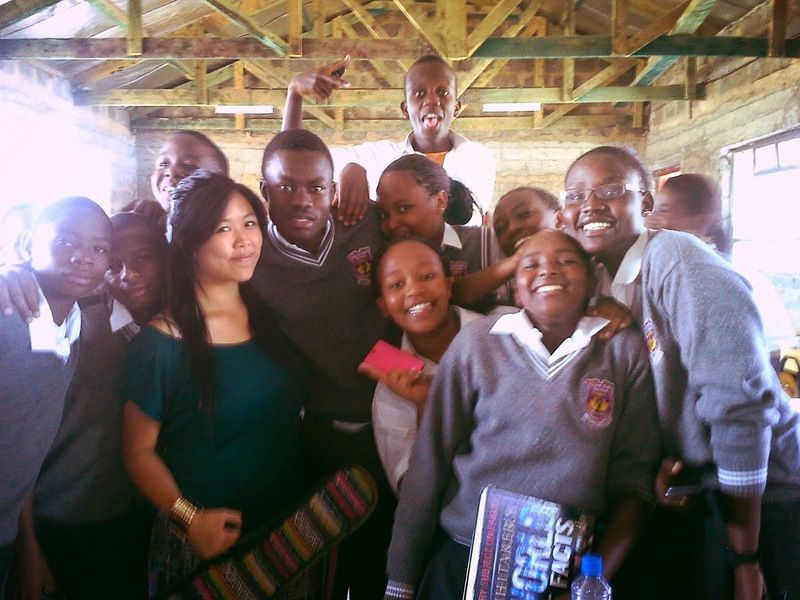 Never would I imagine that I’d have the incredible opportunity to meet and work with about 100 young people between the ages of 14 and 17 through songwriting and music at a Christian highschool in Kenya! What an amazing blessing it was to be connected with Christine Kamau, who is the worship pastor at Life Reformation Church (LRC) in Nairobi, Kenya. Through a Kenyan pastor and friend in Melbourne, I was placed in contact with Christine and her husband Paul Kamau, who is the associate pastor at LRC. They are hosting me for a week in Nairobi, and on the 18th of February, I was so blessed to be able to visit the school that they work at – Northgate School (NGS) in Kantafu, a Christian and values-based institution that was founded by LRC. It is a boarding highschool, and all the students live on the campus like brothers and sisters, and one big family along with the staff and teachers. I was given three classes to run whatever program I had in mind. I learnt that with the Kenyan curriculum, the kids between Form 1 and 2 are only taught basic music theory and history. They are allowed to pursue instrumental music at their own expense, but in the schools, there’s no current syllables for examinable music subjects like they do in Australia where you have Music Solo Performance, Music Chamber Group and Music Styles and Composition (of which I completed all three as part of my final selection when I was at the Victorian College of the Arts School). Several of the students shared with me how they felt presently limited due to the fact that the school does not have an instrumental music program as of yet, for those who want to learn solo instruments like piano or guitar. I really hope and pray that in the coming years they would be able to do something about this, as they have great plans to start a school band for chapel services and to record their own music too! So anyhow, knowing that the kids usually just learnt music theory in class, I wanted to do something different and introduce something a bit more interactive. In each session, I took time to introduce myself, shared my story and a bit about my faith journey, and gave time for them to ask me questions. I took the opportunity to also ask them about why they thought music was important and powerful in their lives. I wanted to know what kind of a program they would love to have and the things they’d like to learn in a music class. I asked if anyone was passionate about songwriting, rapping, writing poetry, playing or singing in a band, recording music, and being involved in church choir. I asked them to share what inspires them to sing, write or play music. I soon realized that these guys and girls were an exceptional bunch of young people. They were all exceptionally passionate about their faith and very intrinsically motivated students. They knew they were in a school that upheld Biblical principles and values. They knew that they were here to develop their identity and character in Christ. They were eager to learn and quick to listen. They knew that God has a destiny and purpose for them, and they are now in the process of discovering it while they are at school. Truly, as Paul Kamau said in one of the leadership sessions for the school captains, it is a beautiful thing to be young and growing in maturity of character. And I saw this at work in these young people, through the godly teaching, guidance and leadership of the school’s directors, teachers and pastors. These young people were so articulate and eager to share, it was wonderful beyond belief! See, this is what I want to go everywhere I go, as someone who is also not much older than the average highschool kid: to share my story and tell them that despite the challenges of temporary limitations they face, they can still make a difference using creative expression and collaboration. They can be influential leaders of their time where they are with the message they bring and the destiny they are discovering in God. It makes my heart so full to see 14, 15, 16, 17 year olds with such an evident desire to do something purposeful with their lives and their God-endowed gifting. Truly, it is a beautiful and rare thing. I thank God for the chance to witness this at work even in a remote small town in Kenya. In the classes, I got the groups to write choruses and compose songs together using experiences and Bible verses that have inspired them in their journey. Some of them never had a music class, much less an interactive music workshop like this in their entire schooling life, and they were so excited to ask me questions and share their songs, dreams and challenges with me. At dinnertime, one of the girls, Lorraine, came to me and shared that before coming to Northgate Highschool, she had never had a music class in her life. And up till my session with them today, she never knew that we could write worship and praise songs based on Bible verses, and she was challenged now to write her own too. I was so glad, and I felt pure joy welling up in me. This is why I am in Africa – at 21. This is why God planted this burden and desire in my heart to give my love for music and songwriting back to Him – so He can use me like this and pour out a new thing into the lives of other young people who have not had the opportunities I have had. This is why. And I felt it so deeply that I knew this is God answering the prayers I’ve prayed thus far – for vision, clarity of my mission, new inspiration, the ability to lead and teach others, confidence to speak to different kinds of people, the desire to reach orphans and widows and the youth of this generation. It was amazing – what the students came up with in their groups of four, five and six. In 20 minutes, they composed songs and some really catchy choruses based on their favourite Scripture verses. One of my favourites was by a 17 year old guy named Moses Evans and his group of four – in between the song, he did a spoken word in Swahili about a friend of his who was an orphan and who found God in his teenage years. Another cool one was a group of four boys who wrote about the Psalmist David’s trust in God – the leader, who’s a brilliant drummer, got innovative and used his metal pencil box, a pen, pencil, and the wooden desk as a drum kit. Man, I was impressed – it really sounded so good! There were some really deep and meaningful lyrics that truly touched me when I reflected on how young some of them were. Indeed, just like I started writing my first worship song when I was 14 – you are never too young to sing about things that matter for eternity, because God himself says so! All the time, I was moving around and helping the groups with musical ideas, melodies and harmonies while playing my ukulele! I really wish that they have a keyboard or piano, but at the moment there are no instruments at the school. After school, John Alex, one of the 16 year old boys, asked to speak with me. We had a good time jamming with a ukulele and guitar along with some of the other kids, and John had the chance to ask me some questions about how I pursued music. He really wants to go to a music institution after highschool and he desires to learn the piano or guitar while he is at NGS. Unfortunately at the moment, as the school has just moved to their new location in Kantafu, things are still developing and there are no instruments available on the campus. Another problem is also that the Kenyan system itself does not encourage or give opportunity for highschool students (in the final two years) to learn instrumental music at school. They are to focus only on the subjects that they are doing for national testing, and at present there are no music subjects at all. So these were some of the challenges that I learned about as I chatted with the students. It is my hope, prayer and desire that God will begin to equip and enable me to develop myself and my skills in music and teaching in such a way that in the future, I would be able to work with a school, church or missions organization to start art programs that will help create opportunities for children and young people in places where such things are mere impossibilities. I believe with God all things are possible, and He certainly wants to see the youth of this generation rising up in dark and difficult places to be the salt and the light – and one of the most effective ways for this to happen is to use the powerful platform of music and the arts to influence current culture. I want to be a part of a mission to empower, inspire and train young people who are passionate about Jesus – so that they will grow to be worshipers, songwriters, musicians, artists, music teachers and music therapists that will influence their worlds for the glory of God and for His kingdom.